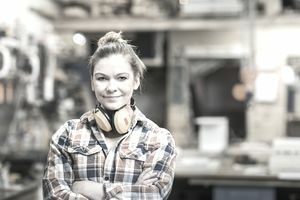 The U.S. Department of Labor defines a non-traditional career for women as one in which 25% or less of those employed in the field are women (Nontraditional Occupations for Women. U.S. Department of Labor, Women's Bureau). It is hard to believe that, in the 21st century, the Department of Labor lists over 100 occupations that fall into this category, among them police officer and architect. It has been over a century since Los Angeles appointed its first female police officer. More than 130 years ago, Louise Blanchard Bethune, the first female professional architect, set up practice in Buffalo, New York (Companion to Women in the Workplace by Dorothy Schneider and Carl F.
Women are underrepresented in occupations across many occupational groups including those in the construction trades and STEM (Science, Technology, Engineering, and Math) fields. When choosing an occupation, a woman should consider all the options available to her. There aren't any occupations that a woman is incapable of doing based on her gender alone. As is the case for any individual, female or male, one will have to meet the educational requirements and other qualifications of the career he or she is considering.